Want a fast way to spruce up your kitchen and streamline the meal planning process? 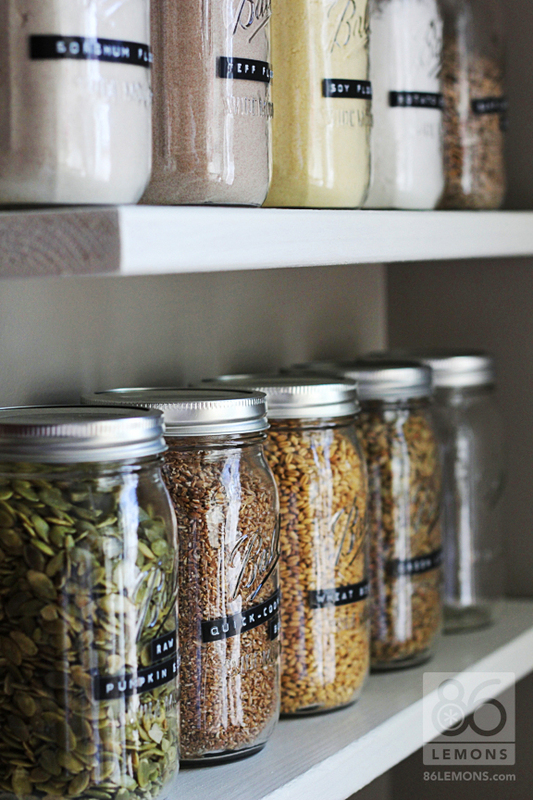 Organize your pantry! Better organization saves time and money and allows you to see what you have at a glance. If everything is a jumbled mess, you risk having products you spent money on expire or go bad; you’ll lose money every time you throw out a box, bag or can that you could have used – -if only you had seen it. Pantry organization makes your life easier as well. The convenience of being able to tell exactly what staples and other items you have on hand at a glance makes menu planning a snap. You can also quickly discover what things you have and what ones you need for a particular recipe without digging around. On weeks when money is tight, assessing your pantry and pulling together inexpensive meals makes it easier to serve up filling and tasty food without the added expense of a grocery store trip. Whether you just love the satisfaction of a carefully organized and well-ordered space or you want to stop wasting time and food, these pantry organization tips are sure to please. For rice, flour and other grains and even spices, clear glass storage jars not only look great, but they also allow you to see “how much” of a specific staple you have left at a glance. This homeowner made ideal use of glass storage in the pantry, creating a clean and elegant look in a small amount of space. In addition to making it easy to see exactly what you have on hand; glass storage keeps your pantry staples safe from pests and prolongs the life of some food items. An open plastic bag or even one tied with a zip tie simply won’t protect your food from air, moisture, and insects. Pushing cans and other goods to the back of the pantry to make space can end up costing you more in the long run. Those products you don’t use right away get shoved aside for new items and forgotten – in many cases, you’ll discover them only after they have expired. Storing items vertically allows you to make the most of your space and to see exactly what you have. This method also helps if you have a lot of one kind of item (canned goods, home preserved items, etc.) that are of similar sizes. You’ll be able to see what you have at a glance and know what you need to use up and what you need to buy. You can purchase vertical storage for the back of your pantry door, or install shelves. Any vertical method will help you free up space and identify the goods you need to use up quickly. Transferring baking supplies, pasta and grains to glass jars or other containers can help prolong the life of these products, but if you don’t label the jars, it can get confusing. Is that white powder regular flour, bread flour or your gluten-free blend? You need to know to keep everyone healthy and to complete a recipe successfully. Stop tripping over over-sized lids and pans by storing them together on the pantry door or shelf; this system uses shallow shelving to corral cookware lids on a lid organizer displayed on the bottom shelf in this photo below. Place large, heavy pieces on simple dollies or wheeled baskets on the floor to keep them close at hand, but out of the way; simply roll them out when you need them. Sort and store like the grocery store does, with the closest expiration dates at the front. Upgrading your pantry and creating a more organized and accessible space will make it easy for you to find what you need and can even add design appeal to your living space, too. If you are in the organizing mode, check out my previous article “10 sensationally Small Laundry Organization Ideas” to get you started.